The Purpose-Driven Life is Heresy! Special Notice: This is copyrighted material. In fairness to those who subscribe to FOUNDATION Magazine, there is usually a significant delay between publication and posting on the Internet. Furthermore, not all FOUNDATION articles are posted on the website. This article is an exception because of the urgent need to alert the unsuspecting of programs that are sweeping through the churches and depart from the Biblical blueprint for Christian living and ministry. This article is available (click here) in a booklet by the same title. Rick Warren, renowned pastor of Saddleback Church in Lake Forest, California, and chief architect of the Purpose-Driven® ministry empire, has influenced thousands of pastors and Christian leaders around the world with his best-selling book The Purpose-Driven-Church and his Purpose-Driven® church growth seminars. Now, Warren has targeted the Christian layperson with his latest New York Times bestseller, The Purpose-Driven® Life (Zondervan, 2002). 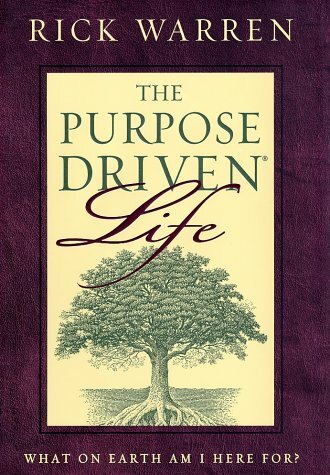 Millions of people have purchased The Purpose-Driven® Life since its release in September 2002, and tens of thousands of churches have either used or are currently using this book and other Purpose-Driven® materials during special campaigns called 40 Days of Purpose. The object of the book, which is divided into 40 chapters, is to explain in 40 days the five purposes of one's life. Bruce Ryskamp, president and CEO of Zondervan Publishing, said The Purpose-Driven® Life "is more than a bestseller, it's become a movement." According to Warren himself, The Purpose-Driven® Life is more than just a book—it is, in Warren's own words, "a guide to a 40-day spiritual journey" (p. 9). Because Warren is admittedly leading people on a spiritual journey—a serious task with profound implications—believers must carefully analyze and critique the spiritual content of this journey. Nothing on earth is more important than understanding the true will of God as revealed to mankind in His Word, the Bible. Therefore, any Christian book or "spiritual journey" designed to lead people to a closer relationship with God must conform to the truth—no room for error is allowed! The purpose of this article is to analyze this particular "spiritual journey"—— The Purpose-Driven® Life—in order to determine whether or not it is, in fact, true and faithful to the Word and will of God. The Purpose-Driven® Life is more than just a book—it is, in Rick Warren's own words, "a guide to a 40-day spiritual journey." written by theological liberals—contain a wealth of applicable (and even Biblical) truths. Almost every book has its positive qualities and a measure of truth to some degree. Nevertheless, the discerning believer and the Bible-centered church must ascertain whether any error is present and then take the appropriate action. Even a small amount of error can produce disastrous results in the lives of men, women and children. churches that have publically endorsed the book and hosted a 40 Days of Purpose campaign. Churches and denominations include: Baptist, United Methodist, Nazarene, Seventh-Day Adventist, Presbyterian, Lutheran, Assemblies of God, Church of God, Vineyard, Calvary Chapel, Christian, Evangelical Free, International Pentecostal Holiness and many others. In addition, leading religious figures such as Billy Graham, Franklin Graham, Bruce Wilkinson, Max Lucado and Lee Strobel have strongly endorsed and recommended The Purpose-Driven® Life. In order for the book to have such strong appeal among such a theologically diverse spectrum of churches and denominations, its content must not pose a threat to the teachings of these churches and denominations. Likewise, the book must either keep silent regarding the dangers of erroneous doctrine or minimize the importance of doctrinal differences altogether. Immediately, one should seriously question whether or not the same spiritual journey embraced by a Seventh-Day Adventist, Nazarene or United Methodist is a spiritual journey that is faithful to God's Word and, therefore, worthy of his use. This campaign is all about the Kingdom of God, fulfilling his agenda in His world. Nothing brings more glory to God than having his churches, small groups, and his people fulfilling His Purposes. Because 40 Days of Purpose is about God's Kingdom, it is much bigger than any individual, church or denomination. We must work together "to serve God's purpose in our generation. (Acts. 13:36). I hope and pray that your church won't miss out on this movement of God. I invite you to join us. We're waiting to partner with you on the journey of a lifetime! "But [God/ wanted to make you in order to express his love. God says, ‘I have carried you since you were born; I have taken care of you from your birth. Even when you are old, I will be the same. Even when your hair has turned gray, I will take care of you. I made you and will take care of you.’" (p. 25). According to Warren, this verse, taken from Isaiah 46:3-4 of the New Century Version proves that God wanted to create mankind in order to express His love. Yet this is God's message to Israel, not to mankind in general nor to believers in the church today. Warren is clearly misinterpreting and misrepresenting the true meaning of the text as the Israelites—the original recipients of this verse—understood it. "Wonderful changes are going to happen in your life as you begin to live it on purpose. God says, ‘I know what I am planning for you ... I have good plans for you, not plans to hurt you. I will give you hope and a good future.’ " (p. 31). Warren cites this text (Jeremiah 29:11 from the New Century Version) several times in his book, but this verse is not informing the believer that wonderful changes will happen in his life once he lives out his purpose, as Warren would have one to believe. This text contains God's personal message to the Israelites who were enduring the Babylonian captivity. "You may have been unaware that God holds you responsible for the unbelievers who live around you. The Bible says, 'You must warn them so they may live. If you don't speak out to warn the wicked to stop their evil ways, they will die in their sin. But I will hold you responsible for their death’ " (p. 283). Warren's claim that God holds believers responsible for the death of unbelieving friends, neighbors and acquaintances is contrary to the teaching of Scripture. Warren attempts to find justification for his statement by quoting Ezekiel 3:18 in the New Century Version. However, in this text, God is directly speaking to a prophet —Ezekiel—to whom God had given a particular, unique task of communicating His Word. Using Ezekiel 3:18, Warren gives the reader the impression that if the friend, neighbor or acquaintance of a believer dies in unbelief, the believer is at fault! Of course, personal evangelism is vitally important to the spiritual life of every Christian, but the believer is not held responsible for the unbeliever's condemnation. "For instance, the apostle Paul almost single-handedly spread Christianity throughout the Roman Empire. His secret was a focused life. He said, ‘I am focusing all my energies on this one thing: Forgetting the past and looking forward to what lies ahead..." (p. 32). This quote is an example of how Warren intentionally seeks out a particular translation of Scripture to support his point even though no other translation lends any support or credence to the one used by Warren. This quote from Philippians 3:13 of the New Living Translation may prove Warren's point—that "knowing your purpose focuses your life"—but it does not accurately relay Paul's words. Paul did look ahead rather than dwell on the past, but he did not "focus all [his] energies" on doing so. The New Living Translation takes great liberty in adding to the true meaning of the text and, thus, portrays the apostle as one whose entire energies were devoted to focusing on the future rather than fulfilling the glory of God through faithful obedience to Him. "Jesus will not return until everyone God wants to hear the Good News has heard it. Jesus said, 'The Good News about God’s kingdom will be preached in all the world, to every nation. Then the end will come ...’ " (p. 286). This text, taken from Matthew 24:14 of the New Century Version, is not describing the prerequisites for Christ's imminent return for His church at the rapture. Within the context, Jesus is referring to the period of time during the seven-year tribulation prior to His return to the earth to inaugurate His millennial kingdom. At that time, the Gospel will be preached—by natural and supernatural means—to the entire world. Then, Christ will return with His saints to judge the nations and rule and reign on the earth. "That God would want me for a close friend is hard to understand, but the Bible says, 'He is a God who is passionate about his relationship with you’ " (p. 86). In this text, God is not saying He wants Rick Warren—or any other believer in the church age—"for a close friend." This verse, which Warren quotes from Exodus 34:14 of the New Living Translation, actually contains God's words to Moses in which the Lord declared, "For thou shalt worship no other god: for the LORD, whose name is jealous, is a jealous God" (KJV). Of course God desires our praise and worship and even our friendship, but for Warren to use this text as a support for his statement that God wants him—or any of us—for a friend is a misrepresentation of the clear meaning of the text. "One of the ways God measures spiritual maturity is by the quality of your relationships. In heaven God won't say, 'Tell me about your career, your bank account, and your hobbies. 'Instead he will review how you treated other people, particularly those in need (Mt. 25: 34-46). Jesus said the way to love him is to love his family and care for their practical needs: 'Truly I tell you, just as you did it to one of the least of these who are members of my family, you did it to me ... (p. 126).’ " This text, taken from Matthew 25:40 of the New Revised Standard Version, refers to the judgment of the nations which will occur following Christ's return to earth prior to the establishment of His kingdom. The text does not refer to the manner in which believers are to treat people on the earth today. Rather, it details how the believing Gentiles during the time of the Tribulation will treat the believing Jews who will suffer for the cause of Christ. "In fact, the Bible tells us that God has given us the ministry of restoring relationships (2 Corinthians 5:18, God’s Word Translation) ... As believers, God has 'called us to settle our relationships with each other (2 Corinthians5:18, The Message) " (pp. 152, 154). Both translations of 2 Corinthians 5:18 may support the point Warren is trying to make— that believers should strive to be peacemakers who restore broken relationships with one another—but both translations have destroyed the true meaning of the text as revealed by the context. Second Corinthians 5:18 does not refer to relationships between individuals but to relationships between individuals and God. The Lord has given Christians the "ministry of reconciliation" (v. 18) and the "word of reconciliation" (v. 19) as "ambassadors for Christ" (v. 20) to declare that unbelievers can be reconciled to God through faith in the person and work of Jesus Christ (vv. 17-21). To use this text as a Biblical support for relationship restoration between individuals is to grossly misinterpret and misapply the Word of God. It is evident that, in many instances, Warren has formulated his own thoughts and ideas and then attempted to find verses or phrases of Scripture to support his presuppositions. Clearly, anyone can cite portions of Scripture to support almost any point they desire to make, but Christians who are interested in discovering what the Bible truly says and means must never take such an approach. Rather, they must carefully read the Bible and understand each phrase and each verse in its proper context (local and remote) and determine how such texts relate to all other teachings of Scripture. "Many people are driven by guilt ... guilt-driven people are manipulated by memories. They allow their past to control their future. They often unconsciously punish themselves by sabotaging their own success" (pp. 27-28). "Bringing enjoyment to God, living for his pleasure, is the first purpose of your life. When you fully understand this truth, you will never again have a problem with feeling insignificant. It proves your worth" (p. 63). "In his book Sacred Pathways, Gary [Thomas] identifies nine of the ways people draw near to God: Naturalists are most inspired to love God out-of-doors, in natural settings. Sensates love God with their senses and appreciate beautiful worship services that involve their sight, taste, smell and touch, not just their ears. Traditionalists draw closer to God through rituals, liturgies, symbols, and unchanging structures. Ascetics prefer to love God in solitude and simplicity. Activists love God through confronting evil, battling injustices, and working to make the world a better place. Is the same "spiritual journey" embraced by a Seventh-Day Adventist, Nazarene, or United Methodist, a spiritual journey faithful to God's Word and worthy of the believer's use? Caregivers love God by loving others and meeting their needs. Enthusiasts love God through celebration. Contemplatives love God through adoration. Intellectuals love God by studying with their minds" (p. 103). "Most conflict is rooted in unmet needs. Some of these needs can only be met by God. When you expect anyone—a friend spouse, boss or family member—to meet a need that only God can fulfill, you are setting yourself up for disappointment and bitterness. No one can meet all of your needs except God" (p. 154). "For God to use your painful experiences, you must be willing to share them ... Paul understood this truth, so he was honest about his bouts with depression (quotes 2 Cor. 1:8-10, The Living Bible). If Paul had kept his experience of doubt and depression a secret, millions of people would never have benefited from it" (pp. 247-248). "You will find that people who do not understand your shape for ministry will criticize you and try to get you to conform to what they think you should be doing. Ignore them" (p. 254). "[A weakness] may be an emotional limitation, such as a trauma scar, a hurtful memory, a personality quirk, or a hereditary disposition" (p. 273). "Your greatest life messages and your most effective ministry will come out of your deepest hurts. The things you're most embarrassed about, most ashamed of, and most reluctant to share are the very tools God can use most powerfully to heal others" (p. 275). "Gideon’s weakness was low self-esteem and deep insecurities" (p. 275). "The Bible gives us plenty of proof that God uses all types of personalities. Peter was a sanguine. Paul was a choleric. Jeremiah was a melancholy. When you look at the personality differences in the twelve disciples, it is easy to see why they sometimes had interpersonal conflict. There is no 'right’ or 'wrong’ temperament for ministry" (p. 245). "Today there are many books and tools that can help you understand your personality so you can determine how to use it for God" (p. 246). "When you attempt to serve God in ways you're not shaped to serve, it feels like forcing a square peg into a round hole. It's frustrating and produces limited results. It also wastes your time, your talent, and your energy. The best use of your life is to serve God out of your shape. To do this you must discover your shape, learn to accept and enjoy it, and then develop it to its fullest potential" (p. 249). "The best style of worship is the one that most authentically represents your love for God, based on the background and personality God gave you" (p. 102). Clearly, Warren has integrated psychological principles and speculation into his understanding of living the Christian life. The Bible does not support the idea that one must understand his "shape" and personality in order to effectively minister. The Bible does not support the idea that a believer's "most effective ministry will come out of [his] deepest hurts" or that the things he is most embarrassed about and ashamed of are "the very tools God can use most powerfully to heal others." The Bible does not support the idea that "most conflict is rooted in unmet needs," for the Bible describes man as a sinner who does not even truly know what he "needs." The Bible does not support the idea that we "prove our worth" when we understand our purpose for existence. And certainly, 2 Corinthians 1:8-10 does not support the idea that the apostle Paul experienced clinical or psychological "bouts of depression" just as the Old Testament does not describe Gideon's weakness as "low self-esteem" and "deep insecurity." Warren has clearly forced his own understanding of humanistic psychological principles upon the Biblical texts. Such an approach is certainly not a healthy, sound part of any spiritual journey. C. S. Lewis—although loved and lauded by many Evangelicals today, Lewis' theology of the inspiration and inerrancy of Scripture and even the doctrine of salvation is unorthodox. Brother Lawrence—a Roman Catholic mystic who wrote Practicing the Presence of God, and advocated a "higher" form of prayer. Mother Teresa—a Catholic nun who believed that her service to others and sacrificial manner of life procured the favor of God. Billy Graham—a renowned evangelist who has publicly committed to working with Catholics, Orthodox, theological liberals and others who embrace and propagate all manner of false doctrine. Aldous Huxley—an English writer who published an influential study advocating the use of mescaline to expand perception and consciousness. Huxley, a guru among California hippies, used LSD and became a proponent of New Age and Hindu philosophy. Albert Schweitzer—one of the leading theological liberals in the 20th century; known for his "quest for the historical Jesus." William James—a 19th century philosopher and psychologist of religion and an advocate of pragmatism and religious pluralism. James wielded a pervasive influence in American religious liberalism as he denied the reality of absolute truth. Henri Nouwen—cited several times in The Purpose-Driven® Life, Nouwen was a Roman Catholic priest, ecumenist, educator and psychologist; one of the leading figures in introducing psychology into the Roman Catholic Church. The personal beliefs and spiritual condition of the aforementioned individuals have a profound impact on their own worldviews, and their worldviews strongly influence their actions and writings. Believers who desire to glorify God and embark on a spiritual journey with Him must rely on God's Word, heeding only the teachings of Godly pastors and teachers whose beliefs, worldviews and subsequent actions coincide with the will of God as revealed in His Word. "Real community happens when people know it is safe enough to share their doubts and fears without being judged" (p. 149). "God warns us over and over not to criticize, compare, or judge each other (Rom. 14:13; James 4:11; Eph. 4:29; Matt. 5:9; James 5:9). When you criticize what another believer is doing in faith and from sincere conviction, you are interfering with God’s business. 'What right do you have to criticize someone else’s servants? Only their Lord can decide if they are doing right’ (Rom. 14: 4 CE V)" (p. 164). "Paul adds that we must not stand in judgment or look down on other believers whose convictions differ from our own: 'Why, then, criticize your brother’s actions, why try to make him look small? We shall all be judged one day, not by each other’s standards or even our own, but the standards of Christ’ (Rom. 14:10, New Testament in Modern English)" (p. 164). "Servants think about their work, not what others are doing. They don t compare, criticize, or compete with other servants or ministries ... Competition between God’s servants is illogical for many reasons: We’re all on the same team ... we've been given different assignments" (p. 268). "When you're busy serving, you don't have time to be critical. Any time spent criticizing others is time that could be spent ministering ... It is not our job to evaluate the Master’s other servants" (p. 268). "Conflict is usually a sign that the focus has shifted to less important issues, things the Bible calls 'disputable matters’ (Rom. 14:1; 2 Tim. 2:23). When we focus on personalities, preferences, interpretations, styles, or methods, division always happens. But if we concentrate on loving each other and fulfilling God’s purposes, harmony results. Paul pleaded for this: 'Let there be real harmony so there won't be divisions in the church. I plead with you to be of one mind, united in thought and purpose’ (1 Cor. 1:10 NL T)" (p. 162). "We share the same salvation, the same life, and the same future—factors far more important than any differences we could enumerate" (p. 161). "Because you were formed to be a part of God’s family and the second purpose of your life on earth is to learn how to love and relate to others, peacemaking is one of the most important skills you can develop" (p. 153). "But for unity’s sake we must never let differences divide us. We must stay focused on what matters most—learning to love each other as Christ has loved us, and fulfilling God’s five purposes for each of us and his church (pp. 161-162). "Nothing on earth is more valuable to God than his church. He paid the highest price for it, and he wants it protected, especially from the devastating damage that is caused by division, conflict, and disharmony" (p. 161). God does love His church and paid the highest price for it, and He does want us to protect it. However, believers do not protect it by clamoring for peace at any price and minimizing important doctrinal differences for the sake of a false unity. According to Warren, God wants His church protected "especially" from damage caused by division, conflict and disharmony. According to the Bible, however, God wants His church protected "especially" from contaminating agents such as false teachings, false teachers and wicked behavior (Acts 20:273 1; Rom. 16:17; 1 Thess. 4:1-3; 2 Thess. 3:6, 14; 1 Tim. 1: 18-20; 2 Tim. 2:16-22; 1 Jn. 4:1-6). The church is protected when believers in the church exercise discernment and judge all teachings, philosophies and programs by the Word of God and subsequently separate from any that conflict with the doctrine of the apostles as given by God Himself. The Purpose-Driven® Life contains other doctrinal problems that could adversely impact the life of a believer who truly purposes to glorify God in his daily Christian walk. Three problems in particular are worth noting. "One day you will stand before God, and be will do an audit of your life, a final exam, before you enter eternity. The Bible says, 'Remember, each of us will stand personally before the judgment seat of God... Yes, each of us will have to give a personal account to God.’ (Rom. 14:10b, NL T). Fortunately, God wants us to pass this test, so be has given us the questions in advance. From the Bible we can surmise that God will ask us two crucial questions: First, 'What did you do with my Son, Jesus Christ? 'God won't ask about your religious background or doctrinal views. The only thing that will matter is, did you accept what Jesus did for you and did you learn to love and trust him? ... Second, 'What did you do with what I gave you?. Preparing you for these two questions is the goal of this book." Despite Warren's claims, Jesus will be concerned about a believer's doctrinal views at the Judgment Seat of Christ, for what one believes determines how one thinks and acts. during this Age of Grace will one day stand before Christ at the Judgment Seat. Unbelievers will have no part of this gathering, for the judgment at the Great White Throne is reserved for them alone (Rev. 20:11-15). Warren then adds, "God won't ask about your religious background or doctrinal views. The only thing that will matter is, did you accept what Jesus did for you and did you learn to love and trust him?" This statement is entirely inaccurate. Whether a believer accepted Jesus Christ as Savior and learned to love and trust Him is not "the only thing that will matter." Despite Warren's claims, Jesus Christ will be concerned about a believer's doctrinal views at the Judgment Seat, for what one believes determines how one thinks and acts, and the Judgment Seat of Christ revolves around the works (or lack thereof) and thoughts (including motives) of believers. Doctrine is extremely important to God! According to the Bible, the purpose of the judgment Seat of Christ is to determine the believer's rewards according to his works while on earth. Second Corinthians 5: 10 says Jesus Christ will judge the believer's earthly deeds to determine whether or not they were worthy of reward. Paul told the Corinthian believers, "Every man's work shall be made manifest" (1 Cor. 3:13). All Church-Age believers will either receive reward or loss of reward according to their works (2 Cor. 5: 10) as well as the motives behind their works (1 Cor. 4:5). Paul describes all the believer's works as "good or bad." Good works are any deeds accomplished according to the will of God which He classifies as "rewardable." The Lord will reward a believer's works on the basis of their quality (1 Cor. 3:13), the attitude and manner in which they were accomplished (1 Cor. 4:2) and the motive for which they were accomplished (I Cor. 4:5). "Bad" works are those deeds that are not accomplished according to the will of God which He does not deem to be rewardable. Bad in this context means "good for nothing" or "worthless" in the eyes of God. It is important to understand that the purpose of the Judgment Seat of Christ is not to determine one's eternal destiny, for those who will stand before Christ at this judgment are already believers and will spend eternity with Jesus Christ. Neither is the purpose of the Judgment Seat of Christ to punish believers for their sins, for they have already been forgiven by Christ at the very moment they believed in Him. Rather, the Judgment Seat of Christ is all about one's actions and motives on the earth—and one's doctrine plays a vital role in one's actions and motives! "A Samaritan woman once tried to debate Jesus on the best time, place and style for worship. Jesus replied that these external issues are irrelevant" (p. 100). "Christians often differ on the most appropriate or authentic way to express praise to God, but these arguments usually just reflect personality and background differences. Many forms of praise are mentioned in the Bible, among them confessing, singing, shouting, standing in honor, kneeling, dancing, making a joyful noise, testifying, playing musical instruments, and raising hands. The best style of worship is the one that most authentically represents your love for God, based on the background and personality God gave you" (p. 102). Warren gives the reader the impression from the aforementioned quotes (and from other statements in the book) that worship is relative—a self-styled (almost "anything goes") act or attitude on the part of a believer. But he seems to contradict himself at times, for at one point he correctly asserts, "Worship isn't for you. It's for God" (p. 66), while earlier in the book, he stated, "We worship God by enjoying him" (p. 55)—in essence, placing the focus of worship on our enjoyment of God rather than upon God Himself. Warren teaches his readers that style and form of worship are irrelevant; in other words, whatever "most authentically represents your love for God" denotes worship. Once again, worship becomes subjective, self-styled and man-centered. It is impossible to truly worship the Lord while simultaneously living in an unholy manner or utilizing any unholy means for worship. if we are to accomplish anything according to God's will. We must worship in accordance with the Word of God—His instruction to us concerning how we are to think and act. Therefore, worship must never conflict with the commandments of God as revealed in His Word—Truth. Third, we are to worship in the beauty of holiness (see Psa. 29:2; 96:9; 1 Chron. 16:29). Holiness, or separation from anything contrary to the nature, Word and will of God, is beautiful to the Savior. It is impossible to truly "worship" the Lord while simultaneously living in an "unholy" manner or utilizing any "unholy" means for worship. True, God-honoring, Biblical worship is totally isolated from anything offensive to the nature of God or anything that contradicts His will for His children. Because worship is integrally linked to humility, truth, holiness and obedience to the Lord, we actually worship our God by doing His will—whatever it might be—with a proper heart attitude. Therefore, we worship God by praying to Him, by singing to Him, by being separated unto Him, by studying His Word, by applying His Word to our hearts and lives, by obeying Him in whatever He commands us to do. This is true, Biblical worship! Moreover, we must keep in mind that worship always entails reverence. We worship God in spirit, in truth and in the beauty of holiness with utmost reverence (fear, respect) for Him. Reverence (and therefore worship) is not intended to make us feel good; it is intended to glorify our Savior. Humility and selflessness are imperative! Worship is integrally linked to obedience to the Savior, not to how we feel. We worship Jesus Christ by glorifying Him, thanking Him and magnifying His name through song, prayer, fellowship, study of the Word and application of the Word to our lives in obedience to Him. And, of course, all this must be accomplished reverently in spirit, in truth and in the beauty of holiness. Believers must derive their theology of worship from the Scriptures—not from an unholy, ungodly culture or from fellow believers who feel at home in this culture and draw their methods for "worship" from it. "Much confusion in the Christian life comes from ignoring the simple truth that God is far more interested in building your character than he is anything else ... God is far more interested in what you are than in what you do" (p. 177). "God uses circumstances to develop our character. In fact, he depends more on circumstances to make us like Jesus than he depends on our reading the Bible" (p. 193). "God is always more interested in why we do something than in what we do" (p. 265). Each aforementioned statement is dangerous, untrue and untrustworthy spiritual advice for anyone's spiritual journey. Yet, the idea that God is far more concerned with one's motives or character than with one's actions is a prominent theme of the New Evangelicalism, and this errant teaching has served as an impetus for worldly, ungodly and unholy living among professing Christians for many years. Often, when a believer questions the unbiblical actions of another professing believer (that it, he exercises discernment and "judges righteous judgment"), he is branded as "judgmental" or "unloving" or "legalistic." "Don't judge me. You don't know my motives" or "I am sincere in my actions, and that is all that matters to God" is the cry of the professing believer accused of unbiblical actions. Yet the truth is this—both motives and actions matter to God; both character and good works are equally important to Him. God desires integrity of character and purity of motive, but He also requires obedience and faithfulness as manifested in "good works." The Judgment Seat of Christ proves that one's works, as well as one's motives and character, truly matter to God (1 Thess. 4:1-2). Believers are to be "sincere and without offence till the day of Christ" (Phil. 1: 10-11). The purpose of Warren's book is to answer the age-old question: "What on earth am I here for?" According to Warren, believers have been placed on the earth to fulfill five purposes. He writes, " [God] has clearly revealed his five purposes for our lives through the Bible" (p. 20). These purposes, according to Warren, are to bring enjoyment to God (p. 63), to learn to love others (P. 125), to become like Jesus Christ (p. 17 1), to serve God (p. 23 1) and to fulfill one's mission (p. 28 1). Yet it can be argued that Warren's thesis itself—that these are the believer's five purposes for existence as "clearly revealed" in the Bible—is not entirely consistent with the teaching of Scripture. The Bible only declares one purpose for mankind's existence: to glorify God. This is man's purpose. From the beginning of a believer's spiritual life in Christ until he is with Jesus Christ forevermore, he is to live "to the praise of [Christ's] glory" (Eph. 1:6, 12, 14). Throughout all eternity God's children will glorify Him (Rev. 4:11). Because the believer is "bought with a price," he is commanded to "glorify God in [his] body, and in [his] spirit" (1Cor. 6:19-20). This is man's sole purpose and reason for existence. Believers have certain responsibilities in Christ—means by which they glorify God. These means are revealed in Scripture and include several of Warren's "purposes"—loving others, becoming like Christ, serving God and fulfilling one's God-given mission of evangelism. But the means by which a believer glorifies God must never become the purpose for existence, for In such an instance, it is possible for the means to conflict with the purpose. For example, if a believer's purpose is to glorify God and also to fulfill his mission of evangelism, the believer may compromise the Gospel message or unite with unbelievers in order to fulfill his purpose of evangelism. Yet such tactics do not glorify God, for they are contrary to the teaching of God's Word. In other words, a believer may embrace the idea that "the end justifies the means" in order to evangelize simply because evangelism is a purpose for existence. However, when one understands that the glory of God is the sole purpose for living, he will evangelize and serve and love others according to the dictates of God's Word, and God will always be praised and glorified in the process. "The greatest tragedy is not death, but life without purpose" (p 30). "The smile of God is the goal of your life" (p. 69). "[God/ longs for you to know him and spend time with him. This is why learning to love God and be loved by him should be the greatest objective of your life" (p. 70). "What does God care about most? The redemption of his people. He wants all his lost children found! That’s the whole reason Jesus came to earth. The dearest thing to the heart of God is the death of his Son. The second dearest thing is when his children share that news with others" (p. 97). "There is nothing—absolutely nothing—more important than developing a friendship with God" (p. 99). "How you treated other people, not your wealth or accomplishments, is the most enduring impact you can leave on earth" (p. 125). "The third reason to make learning to love other people the goal of your life is that it is what we will he evaluated on in eternity" (p. 126). "God’s ultimate goal for your life on earth is not comfort, but character development" (p. 173). Those reading Warren's book might wonder, "What, exactly, is the greatest goal or objective of my life? Is it the smile of God? Is it to learn to love God and be loved by Him? Is it to develop character? Is it to develop a friendship with God? Is it learning to love other believers? Or, does God care about the redemption of the unsaved more than any of the above?" Warren seems to make "all of the above" of supreme importance when, in reality, these various goals and objectives are not identical. Of course, each of these goals and objectives is important, but the reader could gain a much clearer grasp of God's requirements for his life if he understood his sole purpose for existence—to glorify God—and then fulfilled this purpose by accomplishing God's will (exercising the means by which God is glorified) exactly as God has declared in His Word. Some believers who use The Purpose-Driven® Life may disagree with Warren's Purpose-Driven® church philosophy as spelled out in his book The Purpose-Driven® Church yet still feel as though they can follow and recommend The Purpose-Driven® Life program. But Warren's book The Purpose-Driven® Life and his 40 Days of Purpose campaigns are integrally linked to and intentionally promote his entire Purpose-Driven® philosophy—including his Purpose-Driven® Church program (for a Biblical analysis of Warren's Purpose-Driven® Church program, request a copy of the FEA publication "What About the Church Growth Movement?"). Throughout The Purpose-Driven® Life, Warren encourages his readers to read The Purpose-Driven® Church, to implement Purpose-Driven® ministries in their churches and to purchase several other Purpose-Driven® resources. In fact, Warren includes an appendix at the end of The Purpose-Driven® Life that lists additional resources for the reader. Every resource mentioned is associated with Warren's Purpose-Driven® program. The Purpose-Driven® Life may contain some helpful, Biblical truths, but it cannot be trusted to lead a believer on a spiritual journey that is completely true and faithful to the Word and will of God. Why? Because Warren often misinterprets Scripture to his own advantage, conjoins untrustworthy, humanistic psychological principles with Biblical truths, minimizes the importance of sound doctrine, deems holiness and biblical separation as less important than love and unity, refers to enemies of the faith as positive contributors to one's spiritual journey and promotes his entire Purpose-Driven® program. For these and other reasons, believers cannot trust The Purpose-Driven® Life and churches should refrain from participating in the 40 Days of Purpose campaigns. Through formulating his own outline and principles for Christian living and subsequently "proof texting" his presuppositions by finding Scripture texts and translations that coincide with his ideas and philosophy of Christian living, Warren has effectively laid out a blueprint for Christian living consistent with what he thinks a Christian should be but not a blueprint reflecting what God desires of the believer. In other words, a believer who embarks on a spiritual journey and uses The Purpose-Driven® Life as a guide may become the type of Christian Rick Warren wants him to become, but he will not become the type of Christian God desires him to become—a Christian dedicated to the whole counsel of God and to faithful obedience and holy living. Any time a Christian leader minimizes the importance of doctrine and sound Biblical interpretation, he can make the Bible say whatever he wants it to say. At that point, no one can argue or disagree with his interpretation because interpretation has become relative and irrelevant. Warren specifically tells the reader that focusing on "Interpretations" of Scripture results in division (p. 162). Therefore, any criticism leveled at The Purpose-Driven® Life for faulty interpretation of Scripture will be labeled "divisive." Yet, interpretation and doctrine are important and must be a central part of anyone's spiritual journey. At the end of his book, Warren tells the reader, "In this book I have passed on to you what others taught me about the purpose of life; now it's your duty to pass that on to others" (p. 309). Warren admits that his book contains "what others taught [him] about the purpose of life" and then urges believers to propagate his discoveries. Yet believers must disciple others in the faithful teachings of the Word of God—not Rick Warren. Believers must heed and proclaim the words of the New Testament apostles and prophets who penned the words of Scripture and commanded believers to "teach others also" (2 Tim. 2:2) and to "stand fast, and hold the traditions which ye have been taught, whether by word, or our (the apostles') epistle" (2 Thess. 2:15). The Word of God is sufficient to equip the believer "for doctrine, for reproof, for correction, for instruction in righteousness: That the man of God may be perfect, throughly furnished unto all good works" (2 Tim. 3:16-17). Yes, the Bible is sufficient, and yes, God does use pastors and teachers to train and disciple believers in the truths of Scripture, but The Purpose-Driven® Life is not consistently faithful to God's Word and therefore must be rejected by serious, discerning believers.